EnviroKlenz® is an advanced technology that consists of non-toxic high-performance specialty materials effective at neutralizing a wide range of chemical pollutants. The EnviroKlenz formulation is safe and can significantly reduce both toxic and noxious chemicals and odors. Since the technology works fast, it is an ideal material to be featured in a mask for minimizing exposure to a wide variety of odors and nuisance environmental pollution. 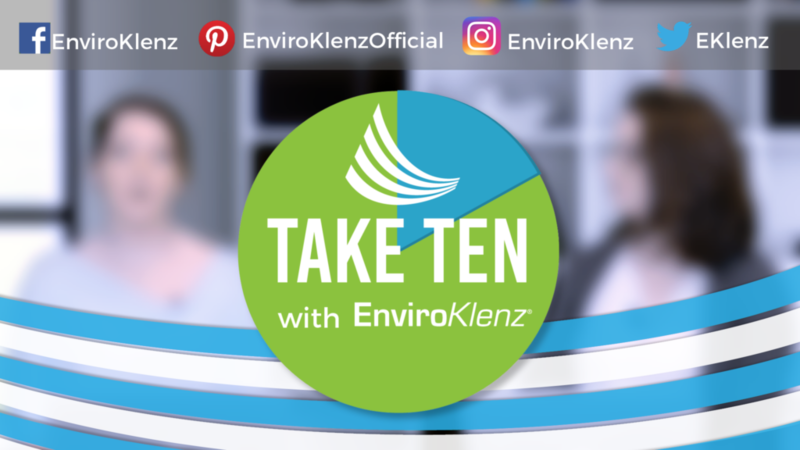 The technology behind EnviroKlenz is capable of reducing hazards associated with common pollutant chemicals including acids, acidic/caustic gases, volatile organic compounds, phosphorus and sulfur compounds among many others. The list below is just some of the many chemicals the EnviroKlenz Face Mask can be used to reduce exposure to nuisance levels of chemicals. EnviroKlenz technology is not just effective, it is fast with a high affinity for chemicals. In the chart below, we have compared EnviroKlenz technology to activated carbon against a common chemical pollutant and carcinogen, Acetaldehyde. Acetaldehyde is a common contaminant in enclosed environments and ambient environments. Since people spend a significant portion of their time in indoor environments, the exposure to this pollutant is quite common. In your home, a possible source of acetaldehyde includes building materials, wood products, plastics, paints, and furniture just to name a few. As you can see by the results, EnviroKlenz had a much higher and faster affinity for the adsorption of the acetaldehyde. EnviroKlenz’s capabilities are not limited to one particular set of chemistries like acetaldehyde. The adsorptive neutralization extends to many classes of chemicals. This is why EnviroKlenz is so effective for air quality solutions. 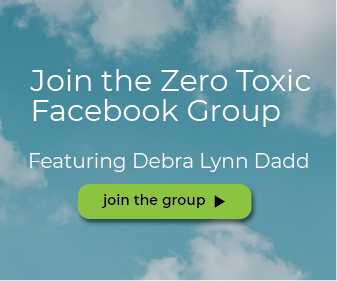 Pollution is not limited to one chemical or chemical family. 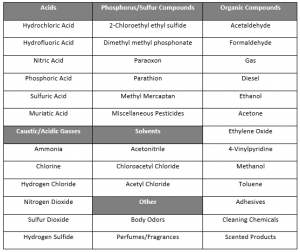 In the chart below you can see EnviroKlenz is capable of capturing a diverse array of chemical compounds and families. 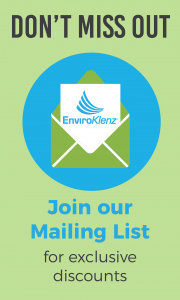 EnviroKlenz utilizes a variety of physical and chemical mechanisms to capture and destroy chemical pollutants. The primary method of capture is physical through the interaction of the high surface area EnviroKlenz metal oxides with the chemical. The EnviroKlenz active components have numerous surface sites to attract and, based on its chemistry, then react with the chemical pollutant. There are various mechanisms of reaction, but one key aspect that is common among them is the reaction byproducts are surface bound. To learn more about dangers of toxic mold, and how EnviroKlenz products can help, keep reading. 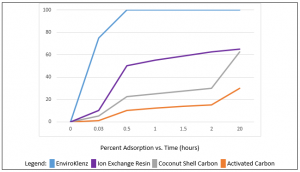 Removal of a pesticide compound by EnviroKlenz activated carbons, coconut shell carbon, and ion exchange resin technologies. Prolonged exposure to even low levels of pesticides have been known to also cause adverse health impacts for individuals, especially to those dealing with MCS. EnviroKlenz offers the ability to chemically dismantle these toxic compounds and reduce exposure. Due to its enhanced chemical reactivity, EnviroKlenz materials have the ability to chemically dismantle a variety of highly toxic compounds. Common pesticide structures have been studied and EnviroKlenz is capable adsorptive neutralization of these compounds. 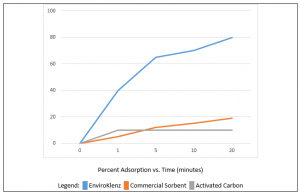 In the graph below, the superior performance of EnviroKlenz is seen by the rapid adsorption of the pesticide when compared to other technologies, including activated carbon. Since exposure to many chemical pollutants can be reduced by the EnviroKlenz Face Mask, it is effective against many common irritants one would encounter in their daily life. These include: cleaning agents, smoke, perfumes, dander, air fresheners, pollen, spores, and dust just to name a few. The EnviroKlenz Face Mask is lightweight, comfortable, reusable, and latex free. How long it lasts depends upon your sensitivities and environment. This product is not NIOSH approved for occupational purposes.